Season 3 of Hannibal really kicks off in its third episode, ‘Secondo’, as established characters continue to develop and new characters join the fray. In Italy, Hannibal ponders his ‘meeting’ with Will. It has left him with much to thing about as he has to explore his feelings towards his friend and nemesis. Of course, Will himself hasn’t come out of his string of encounters with Hannibal unscathed, either physically or mentally and we begin to see just how badly their last falling out has affected the once gentle and compassionate FBI profiler. Lawrence Fishbourne also makes his first appearance of the season as Jack Crawford, who, like any good boss, is very much in tune with his employee and intends to keep Will from courting disaster. It seems likely that Jack and his Italian counterpart will locate Will but whether they will be able to talk him out of his manhunt is another matter entirely. Will’s quest gets a major boost from Chiyo, an old childhood connection to Hannibal, though Will’s methods in securing Chiyo’s assistance are very worrying. Let’s begin by welcoming back Jack Crawford. 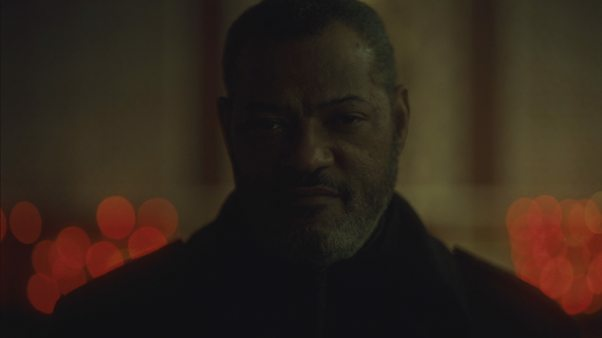 As I’ve mentioned in the past, Jack Crawford isn’t really the most interesting on the show, by any means. He lacks the elegance and the depth that the show bestowed upon Will and Hannibal – and that’s fine because what he does provide is just as critical, in its own way. He grounds the show and keeps it from spirally entirely out of control in the surreal, semi-absurdist art house film fest that show producer Bryan Fuller seems to want it to be. The early seasons of Hannibal were firmly grounded in reality though as the show wore on, the more psychological and abstract elements began to feature more and more strongly. In comparison, this season has barely been grounded at all and instead has opted to dive as deep into its artistry as it can – from the rich colours of the various sets and scenes in Florence and Italy, to the startling references to high culture, it seems that now that Hannibal no longer has to duke it out for survival on NBC, Fuller’s vision can proceed unfettered. Going back to Jack and his purpose in the story, it seems that the battle lines are much murkier now than they have been in the past. It’s unclear just what Jack feels towards Will – is he angered by Will’s betrayal? Probably, but it also seems like there is some degree of lingering affection as well – he doesn’t want Will to risk himself any longer and instead would prefer if he just extracted himself from the situation altogether. Then there is the matter of Hannibal himself. His meeting with Will in the previous episode seems to have thrown him off a little. Their relationship has always had a strange, almost romantic subtext to it and it would seem that despite his actions last season, Hannibal isn’t fully over Will just yet. There are some questions that still linger on about just what Hannibal’s intentions towards Will are at this moment but you get the feeling that after spending all this time with Bedelia Du Maurier, a makeshift Will Graham of sorts, Hannibal longs for the real deal. In essence, Hannibal is in a state of limbo at the moment where he is not actively pursuing any particular objective. 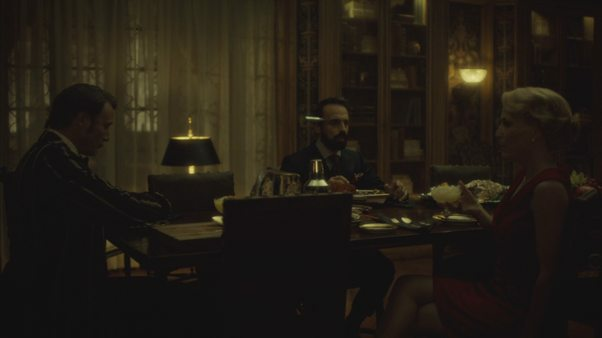 That restlessness is beginning to manifest itself in the way that Hannibal is treating his latest dinner guests; he isn’t getting sloppy in his violence, not at all, but there isn’t any particular reason for him to be taking those risks apart from boredom. Instead of spending time on showing us what Hannibal has been doing, the episode’s main focus this week is how Hannibal came to be. There seem to be two trains of thought here – one, that there was some twisted set of circumstances that led to Hannibal becoming the way he is or two, that Hannibal is a force of nature, a natural phenomenon that has no explanation and cannot be understood from the perspective of cause and effect. Of the two, the former would be more intriguing to see but it would compromise the mystery of Hannibal’s character; it’s one thing to wonder at what horrors could twist a man so far but when those questions are answered, it can be difficult to not be disappointed by the answers. The discussion of Hannibal’s past this week focused on his sister but it isn’t clear at this point whether Hannibal was directly involved in her death and that single fact can change which of the two aforementioned paths the show will take. If Hannibal was a witness to his sister being murdered and eaten, then he is, from some perspective and to some degree, a victim but if he was somehow complicit in her death, then he has always been (and likely, always will be) the demonic figure that the series shows him to be. 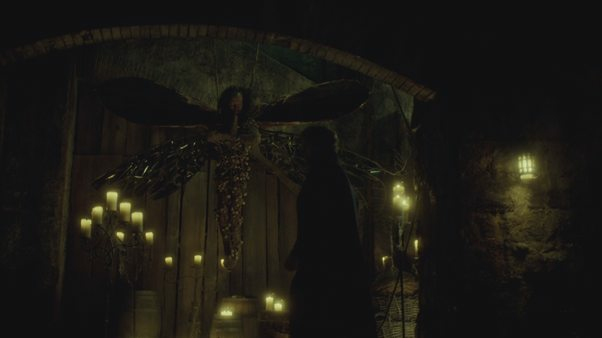 Of course, the characters here are not static; it’s one of the Hannibal’s many strengths that we can see the character evolve and mutate in very tangible ways even if it is over the course of a season. Will has undoubtedly had an effect on Hannibal and you have to wonder about what kind of effect Hannibal’s sister had on him. Hannibal speaks of Mischa fondly enough and while that doesn’t tell us anything about whether or not he killed her, it means that he saw her in the same way he sees Will – one of the extremely rare people that he can connect to. Hannibal mentioned that she made Hannibal betray himself and that’s a charge that could just as easily be levelled at Will too – by making Hannibal change, there is certainly an argument to be made that Will has turned Hannibal against himself. Why else would someone as cold as Hannibal be so affected just by receiving an old friend’s forgiveness? Yet, it is important to remember that it isn’t just Hannibal who is changing. Will seemed a little like a jilted lover in the previous episode, running after Hannibal, trying to settle a score but looking at just how ruthless Will himself has become in this episode, you have to wonder whether his forgiveness was a ruse to throw Hannibal off his game. Both men know each other very well and thus does the game of psychological chess and checkers between them begin.